Multidef is a utility app and service for looking up the definitions of multiple words at one time and displaying the cumulative results in a single, editable window which can be copied to the clipboard, saved to a file or printed. The service works on any text selection in any application that supports services. Turn the service on and off in Services Preferences (accessible from any Services menu), appears in the "Text" section, and is called "Get Multi-Word Definitions." Note that in some Cocoa apps, such as TextEdit, if you select a full line of text by triple-clicking, you can then deselect words by command-double-clicking on them. If you copy the resulting selection, the deselected words are replaced by line breaks. You can use this feature to lookup the definitions of words that make up a non-contiguous selection. • Reset Result On Lookup: replace previous results for a new lookup, otherwise append the new results to previous results. • Remember Query: remember the last query and reload the definitions for it when the program is restarted. • Lookup Only When "Define" is Clicked: only perform a lookup when the "Define" button is clicked. • Sort Results Like the Finder: sort the results in the same order the Finder would sort the list of words being defined. • Include "Remove" Submenus in Recent Menu: include a submenu for each recent item in the recent queries popup menu to remove it. Use the "online resource" buttons "Dictionary.com" or "Wikipedia.org" to lookup the terms in a self contained web window. 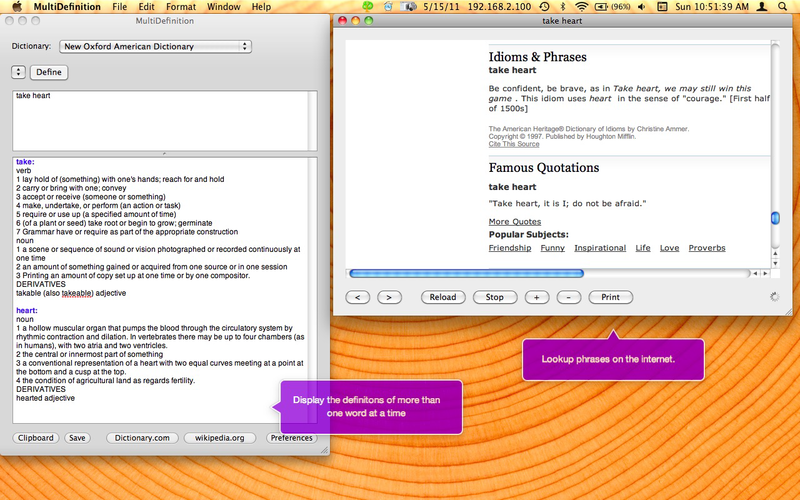 Use the "Save" button to save the results pane to a rich text document you can view in TextEdit or QuickLook. Use the "Clipboard" button to place all the results text onto the clipboard.